Before color psychology, let's first think about "color". This page explains the mechanism to recognize colors, the attributes and classification of colors. First of all, we will explain how the color can be seen. How do we recognize colors? 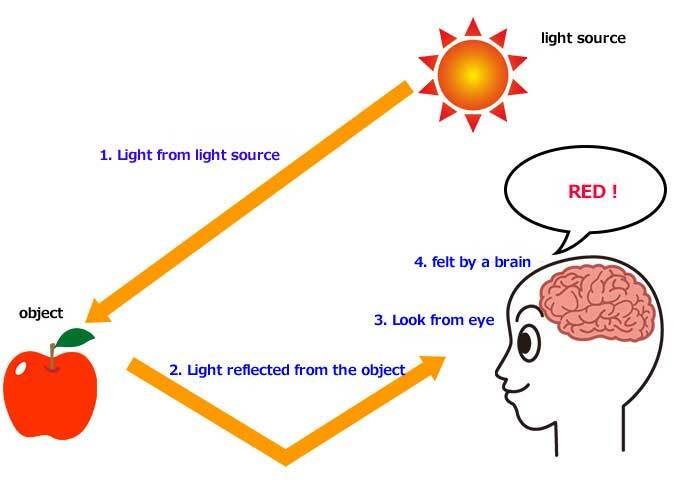 Three conditions are necessary to see the color.It is "light", "object", "eye". So, we will explain how we recognize apples as "red". Is the apple looking red because the apple has a red color? Is the apple showing a red color? It is wrong. The apple is not red. If the apple is red, the apple should look red even though it is dark. However, We can not see the apple in the dark. If you are concerned, please darken the room and watch apples in a bed that does not contain light. Color should not be recognized. 1. Light is necessary for apple to look red. The light contains all colors. 2. When light hit an apple, the apple absorbs light. And it reflects only the red light. 3. That red light is in our eyes. 4. The light which is in the eye is transmitted to the brain, the brain perceives the color and recognizes that "this apple is red". Now that we know the mechanism by which colors are visible, the next is about color elements. First off from the basics! There are three elements in color. "Hue" "Lightness" "Saturation". We call these maturity of color (three elements of color). In short, it is "three natures of colors". "saturation" is to the vividness of the color. These three properties are basic to know the color. Let's take a closer look at each of them. "Hue" refers to the color of red, yellow, green, blue or purple. Hue is the most obvious one to express differences in images. For example, when you buy clothes you think "I want a red skirt" ,"Buy a white sneaker!" Yes, that is hue. The color of the image below is that the hues are "blue". Every color is blue, but there is a difference. Hue can be distinguished between warm color and cold color. In addition, the color is not independent of each, each other is a continuous connection will create a circle of hue. 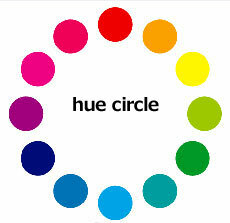 This hue arranged on a circle is called a hue circle. "Lightness" is the degree of "brightness" of color. The color gets brighter as the lightness gets higher, and it gets darker when it gets lower. In the figure below, even the same blue color is brighter as going from left to right. Check　Which is easier to see panda's picture in the figure below? The panda on the right is easier to see! The color with the highest lightness is "white" and the lowest color is "black". And, the bigger the lightness difference, the easier it is to see the color. "Saturation" refers to the intensity of color and the degree of vibrancy of color. Saturation has a strong and a bright color is high, weak and the dull color is low. In the figure below, it is a vivid color as it goes from left to right. The color can be roughly divided into two types of "chromatic color" with color like red, blue, yellow, and "achromatic color" with no color like white, black, gray. Chromatic" has all attributes of hue, lightness, and saturation, but "achromatic color" has no color, so it has only attribute of lightness. 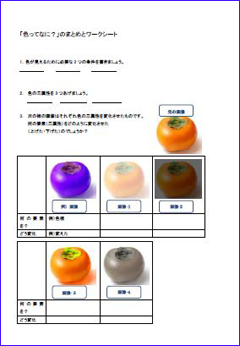 This page summarizes the worksheet. Please use it to confirm the understanding degree of the page. 1. What are three attributes of the color with "luminosity" "chroma" one more? 2. What of the color will you express with "luminosity?" 3. Why is it that an apple looks red? An apple has "a red color"
An apple gives "a red color"
4. What does the element necessary to show a color carry with a "light" "object" one more?